An analysis of xenophobia in South Africa that foregrounds the role of the state. The events of May 2008 in which 62 people were killed simply for being ‘foreign’ and thousands were turned overnight into refugees shook the South African nation. This book is the first to attempt a comprehensive and rigorous explanation for those horrific events. It argues that xenophobia should be understood as a political discourse and practice. As such its historical development as well as the conditions of its existence must be elucidated in terms of the practices and prescriptions which structure the field of politics. In South Africa, the history of xenophobia is intimately connected to the manner in which citizenship has been conceived and fought over during the past fifty years at least. Migrant labour was de-nationalized by the apartheid state, while African nationalism saw the same migrant labour as the foundation of that oppressive system. Only those who could show a family connection with the colonial and apartheid formation of South Africa could claim citizenship at liberation. Others were excluded and seen as unjustified claimants to national resources. 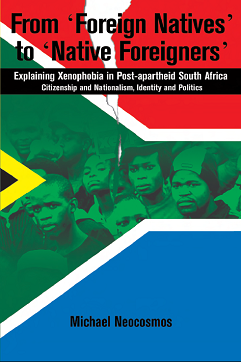 Xenophobia’s conditions of existence, the book argues, are to be found in the politics of post-apartheid nationalism where state prescriptions founded on indigeneity have been allowed to dominate uncontested in conditions of an overwhelmingly passive conception of citizenship. The de-politicization of an urban population, which had been able to assert its agency during the 1980s through a discourse of human rights in particular, contributed to this passivity. Such state liberal politics have remained largely unchallenged. As in other cases of post-colonial transition in Africa, the hegemony of xenophobic discourse, the book contends, is to be sought in the specific character of the state consensus.